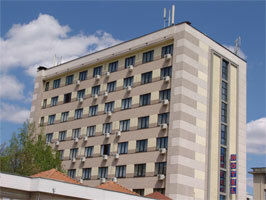 The staff of "Zheleznik" hotel congatulates you for your choice and awaits your arrival. We are situated in the southern part of the town, right next to the City Bus Station, 200 meters from the City Train Station and about 5 minutes walking from the city's administrative, cultural and trade center. The complex is suitable for business trips, hosting of seminars or training programs, as well as for family or tourist groups trips and vacations. Non-smokers rooms - properly signed. Express Check In is available when arriving with reservation or there are vacancies at the base..
Stara Zagora 6000, 1, Parchevich, Str., HOTEL "ZHELEZNIK"